Made a reasonable start about a third way down the line but got better as we had clear air and pulled away from most of the fleet. Wind was a bit fluky and managed to fall into a dead hole at one point but keeping fairly in the middle seemed to work. Went in close approaching St Albans and picked up the normal stronger winds which took us round the corner close in. Tacked up the coast to Anvil Point which looked the best option as we went past a number of boats that had stayed further off, also gave us a nice view of the cliffs from close in. Once past Anvil Point we headed straight out into Poole Bay and the wind then decided to drop off completely. With the tide under us the wind varied from zero and 5 knots apparent and eventually decided to swivel round completely. By then we were getting a bit twitchy as the tide turned at 19:30 which would make it a difficult getting to the finish at North Head. Seemed to be a band of wind running round the shore and we eventually got into it and just to contradict the rest of the trip across Poole Bay we powered to the finish with a decent breeze. 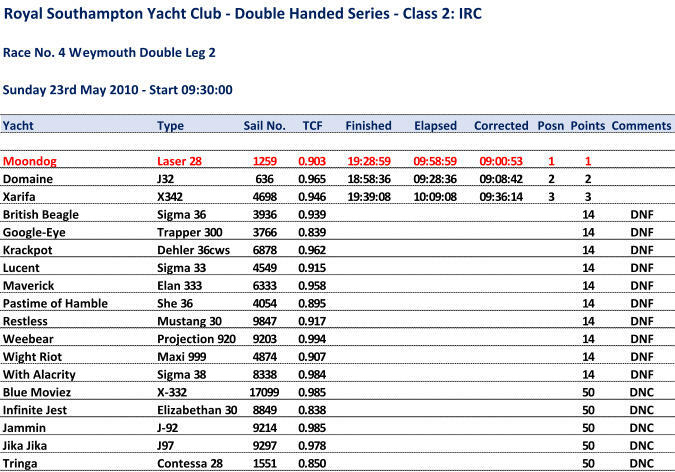 Bit twitchy on our finish position as we had seen Domaine finish at least half a hour before us but as it turned out we had 7 minutes on corrected so pretty good weekend with two wins and think we might have the Off Shore series in the bag.